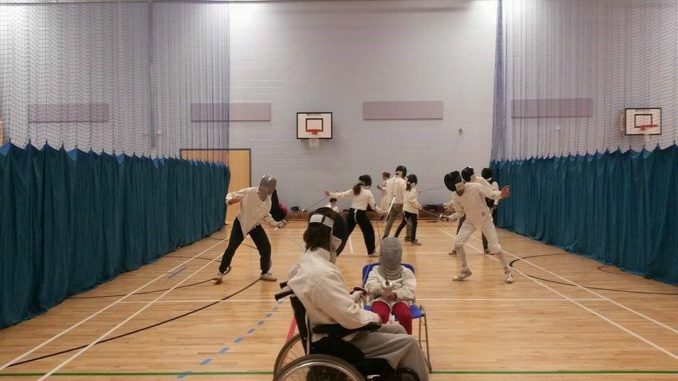 Ramsgate Fencing Club is running a beginners’ course for local children to try the sport. Wheelchair users are welcomed. The course is at Ramsgate Sports Centre on Thursdays from 5pm until 6 pm and starts on September 13. For further details email kentfencing@hotmail.co.uk. People should bring trainers and a drink. Ramsgate Football Club is recruiting new players for their Ramsgate Colt Under 12 team as part of their progressive Ramsgate Youth Academy. We are looking for talented football players aged between 11 and 12 to come along to our trial evening on Tuesday 13th September, who love playing football and can dedicate time to training every Tuesday and play weekend league and Cup games. In the first instance, parents, guardians or carers should contact the team manager, Martin Bishop via email at ramsgate12b@gmail.com to register their interest and find out more about the sporting opportunities offered by Thanet’s oldest and most progressive football club! 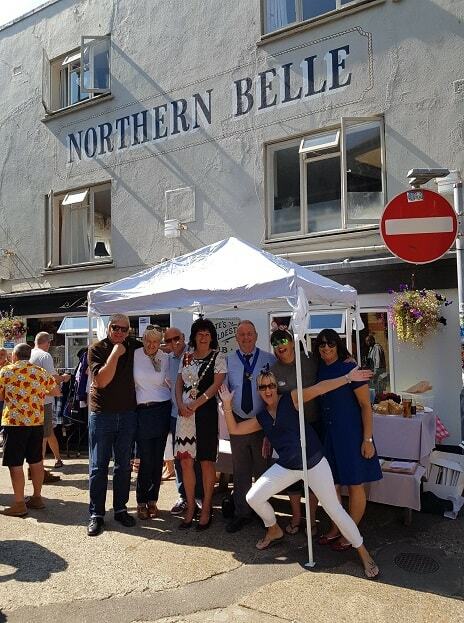 The town’s oldest boozer, dating back to 1680, hosted DJs, live music, a record and vintage clothing stall, barbecue and raffle in aid of Pilgrims Hospice. Money raised at the Across The Board event is still coming in. The Old Vicarage Charity Ball committee are proud to announce that this event made £1845.00. The charity that benefitted from this was Thanet Animal Group. We presented them with a cheque at their open day. The screening of A Plastic Ocean, the moving documentary narrated by Sir David Attenborough, at the Palace Cinema, Broadstairs, last week was a SELL OUT. Organised jointly by Thanet Over Fifties Forum (TOFFS) and Broadstairs Town Team, the film highlighted the global impact of plastic pollution on the world’s seas and beyond, arguing that the problem was not limited to marine life, but also to human and other land-based life too. Once plastics enter the oceans, they break up into small, toxin-filled particles which in turn enter the food chain and are eventually consumed by us. TOFFS Co-ordinator Pauline Petitt said: “This is an issue which members of the Thanet Over Fifties Forum felt very strongly about and wanted to learn more. It became evident to those present that the scourge of plastic waste will not only affect future generations but is indeed already having an adverse impact now. “Please, please do your bit to reduce your use of single-use plastics, as together we can make a difference, especially locally, to safeguard the beautiful marine and bird life around Thanet’s coastline”. Greenpeace UK is also running an online petition asking UK Supermarkets to “Ditch throwaway plastic packaging!”. The petition has attracted more than 700,000 signatures to date and is available to sign at www.greenpeace.org.uk. Pauline added: “A big thank you to everyone who came to watch A Plastic Ocean, which proved to be an extraordinary documentary. All ticket sale proceeds went to the Plastic Oceans Foundation to help them continue to educate and inspire”. Next up for TOFFS is a Forum Meeting at the Gap Centre, Broadstairs, on Wednesday 19 September at 1:30pm, where Steven Harrison of local solicitors Robinson Allfree will speak on Lasting Powers of Attorney, Estate Administration and Trusts; along with Ged Timpson from Thanet Clinical Commissioning Group on changes to accessing GP services locally. To find out more about TOFFS, which is free to join for over 50s in Thanet, contact toffs@thanetvolunteerbureau.co.uk or call 01843 609337. The Charity Shield Fishing Match in support of chosen charity, Pilgrims Hospices took place last month at Stonar Lake, Sandwich raising an amazing £4,219.42 for vital hospice care. The pairs match which was made possible by the hard work of organisers Brian Allen, Jon Weir and John Sturge, proved a great success again this year. 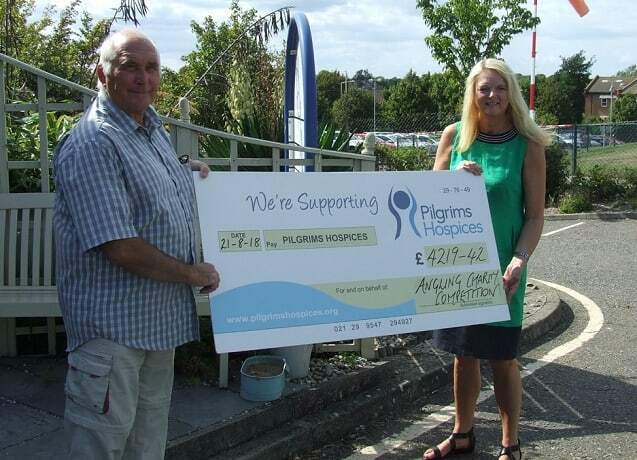 Through generous sponsorship the event and fishermen, raised an amazing £7,366 over two years for Pilgrims care. John Sturge presented the cheque to Karen Kenward, Pilgrims Hospices, Community Fundraising Manager at the hospice in Thanet last week. The superb weather lasted throughout the weekend with all those involved having a great time at the barbeque on Saturday and prize draw on Sunday. All prizes for the draw were donated by local business and supporters. 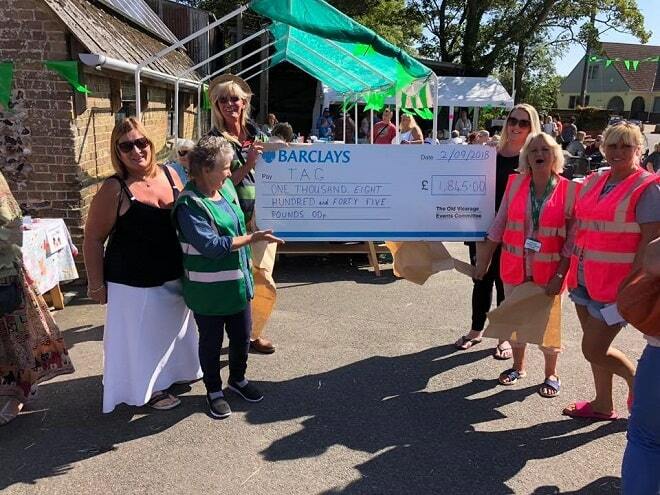 “We are very pleased to have presented the cheque to Pilgrims Hospices, the charity is a much-loved and important part of our community.” John added. If you have an event that you would like to speak to us about, please call Karen Kenward on 01843 233934 or email: karen.kenward@pilgrimshospices.org. The League of Friends of the QEQM Hospital has arranged a Fashion Show & Supper as part of its fundraising to buy equipment and facilities to benefit our local hospital. It’s on Thursday 11th October at 7pm for 7.30pm at the Winter Gardens, Margate. Local stores Amber Rose, Edinburgh Woollen Mill, La De Da, Laura Ashley, Roman & The Saltworks are all very kindly lending some of their fashions, which will be modelled on the evening. Tickets are £23, which includes a two-course meal, and can be obtained by ringing (01843) 234507. Prior booking is essential and any dietary requirements must be advised at that time. There will be a Parish boot fair held at Church House, on September 15 from 9am to 12 noon. Enquiries and to book tables Phone Doug on 01843 843761 or Sue in office on 01843 840777. Don’t miss the chance to grab a bargain, or take a table to sell some of your own bargains! 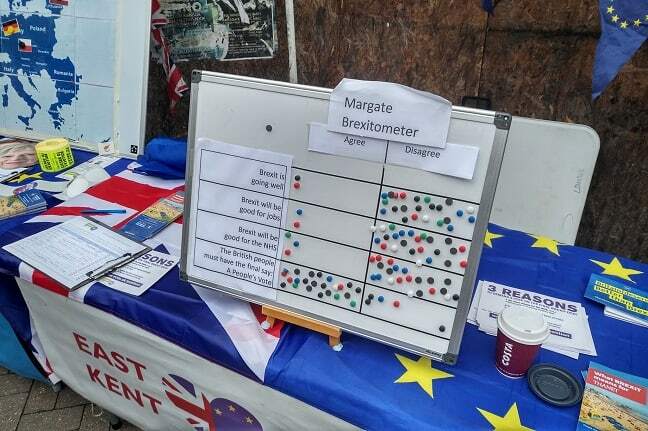 Members of the Thanet 48% group have held two ‘Brexit-o-meter’- stalls in Ramsgate and Margate. On Saturday,September 1) a street stall was held in Ramsgate High Street. The group say their poll showed that the public disagreed that Brexit is going well, disagreed that Brexit would be good for either jobs or for the NHS. The street stall was supported by a number of cross-party members representing the Green Party, the Lib Dems and the Conservatives. 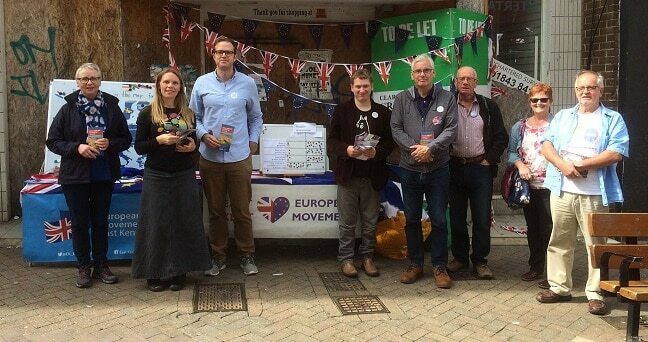 On Saturday, September 8 the pro EU group was in Margate High Street. One of those attending was Rob Yates, who hit the headlines earlier this year over his BLOCKBREXIT window signage on his flat in Arlington House. During the event a leaflet recently published by the East Kent European Movement entitled “What BREXIT Means For Thanet” was distributed.